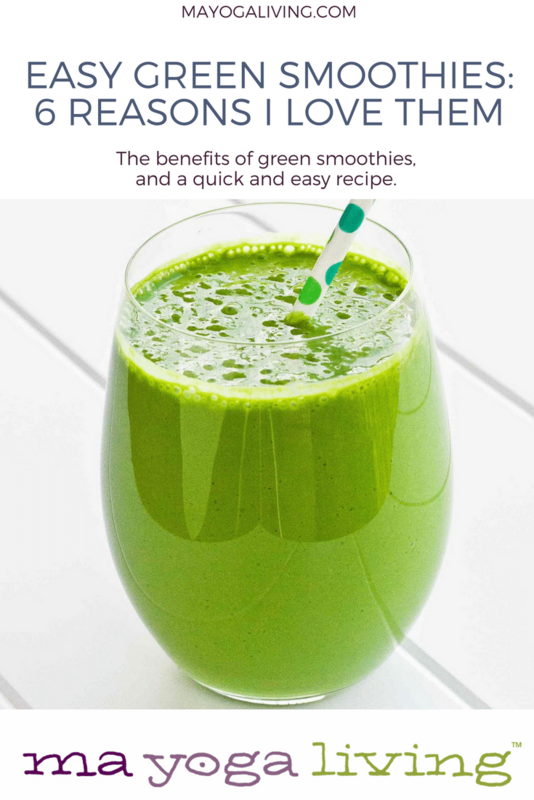 The benefits of green smoothies, and a quick and easy recipe. Easy Green Smoothies, why do I love thee? Let me count the ways. I have found no better food worthy of starting my day off right than an easy green smoothie. It’s quick, easy to carry on the go, and sets a precedent for making good, nurturing choices for myself. If you’re ready to try, all you need are leafy greens, fruit, some good fat (avocado) and/or protein (seeds) if you’re hungry, and water to concoct your own unique creation. 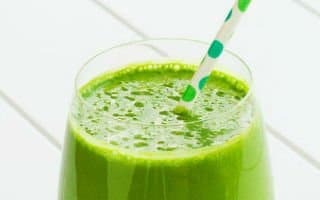 Full of important vitamins, minerals, and micronutrients, green smoothies pack a healthy punch to clease your system and give you tons of energy. Below are just a few of the reasons why they’re my favorite breakfast as a busy mom. You don’t need an expensive blender like a Vitamix or a Blendtec for an easy green smoothie (althought it’s nice). Any blender will do, and a Nutribullet is perfect because it’s powerful, easy to clean, and you can take the cup you made it in with you – with its own lid. Green smoothies awaken our healthy cravings. Dark, leafy greens contain the deepest intelligence of the plant. Chlorophyll is the plant’s ability to transform sunlight into energy. Our world and our lives depend on this. When we eat greens, the chlorophyll awakens our cells’ intelligence, which might have been buried under lots of, well, not-so-smart food. As a result, our cravings begin to change; our feeling of connectedness to our ecosystem grows; our access to our inner knowing and thus our greatest potential emerges. Not to mention it gives you an awesome buzz! If you’re a coffee drinker, try this first and put your coffee off. Who knows, you could eventually decide to replace caffeine with green. Greens are cooling and detoxifying. They’re great for acne, itchy rashes, and overheating—whether physical or emotional. Eat them for any meal of the day to clear out your energy channels and put some natural air-conditioning into your blood, calming your nervous system. Of all the six tastes available in our culture, bitter is the most rare. And yet, according to Ayurveda, it has this wonderful ability to scrape and clean our physical and energetic channels, and cool us down! 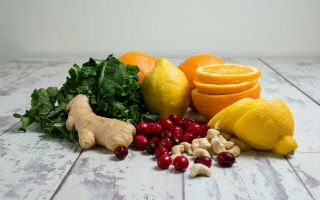 Our palates are not used to bitterness, so as you begin to incorporate more greens into your smoothies, you might need to add fruit to them. Bananas, apples, peaches, strawberries, pineapple, and pears are all great choices. Dates are a yummy way to sweeten anything. Pungent is important if you need a little digestive support. It also warms it up which helps calm the nervous system – especially important if you tend to experience anxiety. Making a green smoothie is a co-creative act. Make it with what you have around. Then taste it and add something else. You’ll learn as you go. Cucumbers are sweet. Carrots are even sweeter. You could even give sweet potatoes a try! For a creamy addition try a little bit of avocado. If you’re super hungry, add oats or tahini. Concerned about too much sugar? Add some almonds. There are endless combinations to create a delicious, plant-based smoothie, and reconnect to food as earth’s nourishing offering to us. Breaking down raw leaves and seeds in a blender makes it easier to digest so nutrients become more accessible to the body. When your food looks similar to what it will look like in the stomach,your body has to do a lot less work to get the nutrients out. Thus, we have more energy for things besides digestion. Adding a bit of ginger to your smoothie helps with digestion – and on colder days, helps warm it up. Use room temp water and greens for additional digestive support. 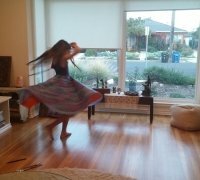 Co-creating with the universe means letting go of being rigid around recipes, and feeling our way forward. It means looking around and seeing what’s available (in your fridge or at the market) and what calls to you. Walk down the organic aisle and imagine the veggies can talk silently into your brain. Which ones are saying “eat me” the loudest? It also means asking yourself questions, even tasting it as you go: sweet enough? need a little more spice? feel too light? Remember, the word “oil” is the same as “love” in Sanskrit, the ancient language of Ayurveda and yoga. So nurture yourself with a wonderfully creamy, satiating smoothie that’s perfect for you right now! 2 handsful of greens – dandelion leaves from your (unsprayed) yard, or get kale, chard, spinach, or greens from the tops of root vegetables like beets and carrots, or just lettuce greens. Add veggies if you like. I blend, pour into a jar, and drink all morning. Check in and see how you feel after drinking. Some people who are trying to cut back on coffee drink this first, and are surprised about the nice wake-up buzz all those micro-nutrients provide! On days that you make a green smoothie in the morning, notice how much easier it is to make healthier choices throughout the day. You are waking up our intelligent cravings, and stepping into a nurturing role with yourself. Invite your wise, powerful, nurturing “Ma” Self to put on the chef’s hat every day! If you would like a free ebook of super quick and easy, nourishing recipes for you and your family, click here. 3:30 pm | Comments Off on Are You Playing Small or Choosing the Highest?